“When patients come to an ED with suspected stroke, they need immediate evaluation by a specialist who can confirm the diagnosis and make treatment recommendations,” said Jennifer Humbert, R.N., Penn State Hershey LionNet coordinator. Although most community hospitals don’t have neurologists and neurosurgeons on-site all the time, participating community hospitals now offer their patients access to Penn State Hershey experts in their own hospital. “ED doctors are generally not too comfortable making neurology decisions without support and guidance, so we can provide that,” said Ray Reichwein, associate professor of neurology and codirector of Penn State Hershey Stroke Center. Patients, family members, doctors, and nursing staff communicate with specialists at Penn State Hershey as if they were standing in the same room, even though they may be miles away. “It’s like a big Skype session,” Humbert said. Since going live in July 2012, the telestroke program’s seven partner hospitals have used the clot-busting intravenous tissue plasminogen activator (known as IV tPA) as much as 300-500 percent more often than prior to the partnership. This is promising news to patients. Faster treatment means less brain damage and faster recovery time for stroke patients. “No matter where a patient presents, they can still have access to the same level of care as if they had come to our doors,” said stroke program manager Kathy Morrison, R.N. As part of the telestroke program, Penn State Hershey doctors meet quarterly with medical personnel at partner hospitals to review data and discuss how to improve care by educating emergency department and EMS providers, as well as the community at large. 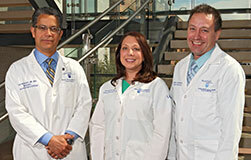 Since the program began, Penn State Hershey specialists have participated in nearly 450 telestroke consults. Only 25 percent of those patients needed to be transported to Penn State Hershey for advanced care. A full three-quarters of stroke patients have been able to receive the care they need at a hospital closer to home, a reassuring benefit to the patients and their families.